There is a passage in W.G. Sebald’s Vertigo in which the narrator regrets the loss of the beautiful view he had once enjoyed from Burg Greifenstein onto the Danube : “A dam has been built below the castle. The course of the river was straightened, and the sad sight of it now will soon extinguish the memory of what it once was”. 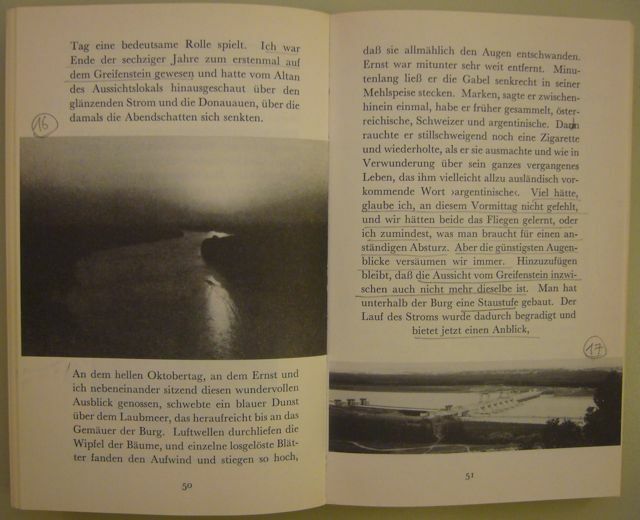 Sebald includes two photographs in this passage, the first, a darkish picture of the view from the Burg taken in the late sixties or during his visit in 1980 with Ernst Herbeck, the second at some point after the river had been dammed. Both photographs are printed on facing pages in this German edition of Vertigo. Two views from Burg Greifenstein in W.G. Sebald's Schwindel. Gefühle. (Frankfurt: Fischer, 1996). I was reminded of this passage recently when reading The Oregon Trail (the 1849 text edited by Bernard Rosenthal for Oxford UP), Francis Parkman’s remarkable account of his journey west through Kansas, Nebraska, Wyoming and Colorado as he pursued “some inquiries relative to the character and usages of the remote Indian nations”. 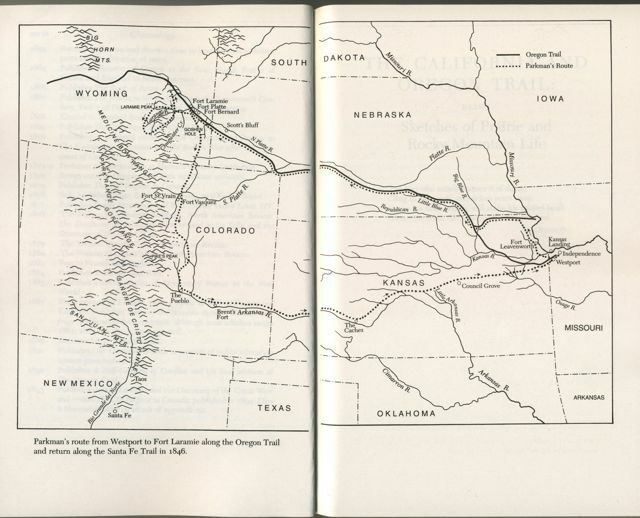 Map of Parkman's journey in the Oxford World's Classics edition of The Oregon Trail (Oxford: Oxford UP, 1996). The Missouri is constantly changing its course; wearing away its banks on one side, while it forms new ones on the other. Its channel is shifting continually. Islands are formed, and then washed away; and while the old forests on one side are undermined and swept off, a young growth springs up from the new soil on the other. Parkman’s journey took place in 1846. Since then, of course, things have changed. The Missouri was dammed extensively over the course of the twentieth century: according to the Wikipedia article, there are now 15 dams on the river. So it’s fair to say that it mustn’t look anything like it did in Parkman’s day. But is this something to be regretted and lamented? I don’t know. Cover of David Blackbourn's The Conquest of Nature (London: Pimlico, 2007). 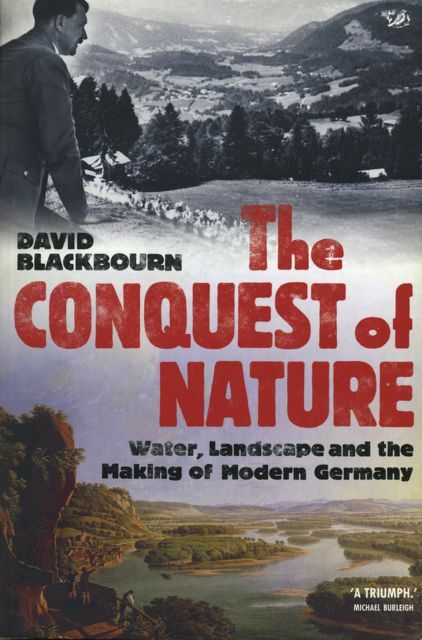 The Conquest of Nature: Water, Landscape and the Making of Modern Germany (2006) is David Blackbourn’s fascinating account of how Germans have altered their landscape over the past 250 years “by reclaiming marsh and fen, draining moors, straightening rivers and building dams”. From Frederick the Great’s vast land-reclamation projects in the mid-eighteenth century to the rise of the ecological movement after the Second World War, Blackbourn considers the various technological, practical, aesthetic, economic, political and racial considerations involved in these “wars” waged by mankind against “nature”. Blackbourn is neither a pessimist nor an optimist in this matter: he neither idealizes the past nor glorifies the present. On the contrary, he invites us to entertain two contradictory ideas in our heads, the real gains and losses brought about by man-made changes to the landscape. As he makes clear, we basically don’t know what consequences these changes will ultimately have: as he says: “All history is the history of unintended consequences, but that is especially true when we are trying to untangle humanity’s relationship with the natural environment”, and it is these unintended consequences “that have to be summoned by an effort of the imagination, the possible future costs that have to be set against the confident promises of the present”. This is one of the things that make this a remarkable book and a pleasure to read, one of those books that makes us slightly less ignorant than we were. It is sometimes nice, of course, to think, like Sebald’s narrator seems to, that it would be best to leave “nature” alone, that man’s interference in “nature” can only result in destruction and, above all, in ugliness. But who knows what the river looked like before Sebald saw it in the sixties? And who knows what it would have looked like had the dam not been built? This entry was posted in David Blackbourn, Francis Parkman Jr., W.G. Sebald and tagged Conquest of Nature, David Blackbourn, Francis Parkman Jr., Oregon Trail, Sebald, Vertigo. Bookmark the permalink.